As I noted the other day, I've been watching Foyle's War on DVD. Today, I took some time out to watch the "Casualties of War" story and was surprised when a young boy, who had been suffering severe shock from his schoolhouse being bombed, can clearly be seen reading The Beano. I'm always pleasantly surprised to see little nods to comics in other media, especially when it's done more casually. Despite the look on his mother's face in the above screen shot, she's not at all upset about his reading the comic. It's not even mentioned and just used as a background prop really. The boy is seen reading it again later when the title character comes to check in on him. ... And has it read aloud to him by another character who's trying to cheer him up. Of course, we start running into some minor complications here. The prop for this film is clearly a reproduction as it's pristine white pages and lack of tears and dogears are meant to show that the comic is new. And when it's read aloud, the lead story is poking fun at Hitler and Goering. Clearly a deliberate intention to show it's authenticity to the World War II era in which the story is set. 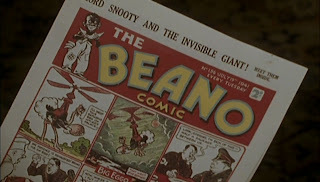 It's clearly shown as The Beano #156 cover dated July 19, 1941. Two years before when this story takes place. We also can see what great shape that particular issue is in. Now, sure, a 1941 comic could survive a few years even through a major war but it seems kind of unlikely to me to make it through that unscathed. The boy and his mother had packed up and left their home in a hurry after the boy's school was bombed. Plus, he's clearly shown reading the heck out of it. Oh, and there was a lot of paper rationing and recycling going on. It's really a minor point to the overall story, but it just struck me as curious as to why they decided to focus that much attention on the front of the comic, when it really wasn't at all necessary. Viewers could clearly see title the boy was reading, and the general look and layout would've been enough to suggest it's historical appropriateness. Why highlight that it was two years wrong? In any event, the cover story featured Big Eggo, a comedic somewhat anthropomorphic ostrich character. "Big Eggo" was featured as the cover story in every issue of The Beano from July 1938 until January 1948. It continued on within the book for another year or so until the strip's creator, Reg Carter, died. The absurdly racist pickaninny character in the masthead was there from the start of the magazine's production and wasn't removed until shortly after World War II. As far as I've been able to determine, the character was never named. I suppose he was intended as a mascot of sorts, as I can't find any references to an actual comic strip featuring that character. 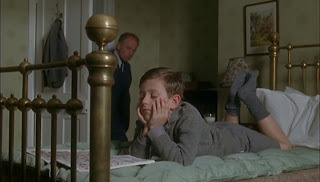 In any event, that's The Beano's cameo in Foyle's War. From the remaining episode descriptions I've scanned through, it doesn't appear that children play much of a role in the remaining stories, so I suspect that's the last of the old comic appearances.